Whenever you are planning to interview some personality then the official way of going about it is seeking permission to interview by writing a formal request letter. Such a letter should contain the reason for which you wish to interview the person, the estimated time for which you need to interview him and the number of questions you have to ask. This makes your request letter complete and informative leaving no room for any kind of doubt. So refer to the sample given below and create a personalized letter seeking permission to interview in a professional way. I am a student pursuing a three year course in Food & Nutrition at Manchester University. I received your name from my professor Dr. Richard Thomson and I would be really very thankful if I could meet with you in person. I would like to interview you in person. Please let me know that if you are available during the first week of March, 2015 so that I can make arrangements for the interview accordingly. I have a set of approximately eight questions to ask which will roughly take 30-40 minutes of your precious time. I highly appreciate for considering my request. I shall call you on 05.02.15 to find out if you are available on the duration mentioned above or you may leave a message for on the contact information mentioned above. Thanking in anticipation. I am looking forward to meet with you. If you are organizing an official event then writing a permission letter for event is a must. 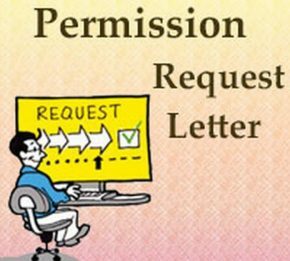 Permission letter is one of the most common letters that is written with an intention to seek the permission from a person to grant an authority to take some decision or to do something. If you are planning to use any kind of copyright content or any other thing in your presentation, paper or for any other purpose then you must write a professional permission letter seeking the permission from the company or person to use it. There are times when you need to leave the office early. For instance, it is your wife’s birthday or you have to attend some function. Human Resource Manager needs to be really very smart and skilful when it comes to writing an employee termination letter for theft.